Let me take you back to April this year when I was given a £50 voucher to buy something to wear at my Boden party. After much deliberation, I ordered the Bistro Crop Trousers in White and the Short Sleeved Wrap Top in Hibiscus...and here started a series of exchanges, which finally ended last week...phew! It's just as lovely as I remembered and I'm amazed it's not sold better (currently in the clearance section). I've bought the 12 so I'm guessing it comes up a bit small as I normally wear a 10 in a jacket. 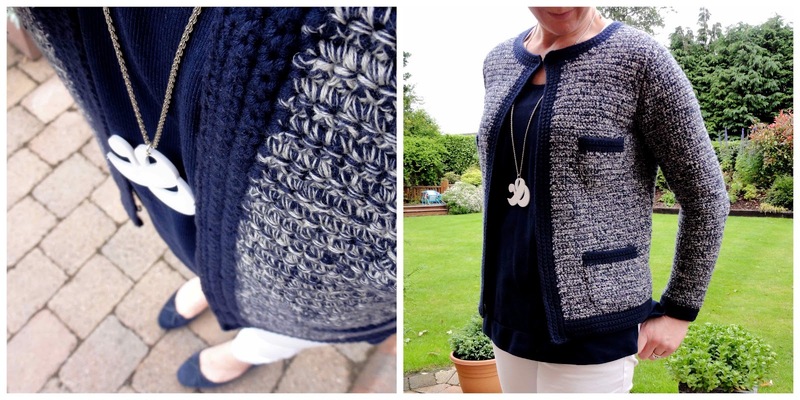 I adore the Chanel-esque feel it has yet it has a more casual feeling than a boucle jacket because it's knitted. My only criticism is that the sleeves are close fitting and don't have much give. I can't imagine wearing a longer sleeved top under it. But that makes it perfect to wear over a short sleeved top on a day like today where there was a nip in the air. I wore it today with white H&M skinny jeans, navy pumps from the LK Bennett Outlet (similar), a navy top from Dorothy Perkins (similar) and my white Ampersand pendant from Pluck & Devour. 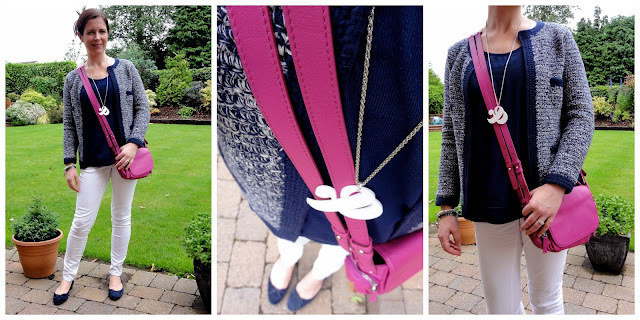 I added my Kurt Geiger pink cross body bag (similar) when I headed out this morning. Just the pop of colour it needed I reckon. So the moral of the story is that Boden really do have the best returns policy ever. Every return was free of charge and every replacement delivery was free of charge. Other online retailers take note! Perfect! I have a similar blazer and I just love it! It's gorgeous. And yes Boden's service is amazing - they've even refunded me immediately on the rare occasion there is a fault - instead of waiting to receive the item. As soon as I laid eyes on this jacket I loved its Chanel vibe - and I must say that's impressive service from Boden *pat on the back*. Any company with such a brilliant returns policy gets my vote. It means I'm just more likely to order from them than if I had to pay high delivery charges and high returns. I like that jacket also, it got a pink post it note put on it in the catalogue a while back, but I never got round to ordering it. Anything like Chanel is always a winner in book. Boden are great with faulty stuff, even when it is not their fault a jeans zip once cause a hole in one of their Bretons and I got my money back, fabulous. I've been looking for a pink cross body. I should have bought the Boden one that was in the preview, but it wasn't going to arrive in time for my vacation. Will definitely buy it when it comes back around (with coupon codes of course). Boden does have the best return policy. My girls wore sweaters we bought them that came apart after a few washes. They were returned without question! Avril I can't believe that jacket/ cardigan is reduced......I loved it in the catalogue when it first came out and thought it would sell out. Lucky you. It looks lovely.........I must be strong, have been a bit naughty of late! I love it when retailers treat the customer well. It's so rare! Boden is brilliant for customer service.